Fridays throughout February, Screenings at 1 p.m. & 7:30 p.m.
Film Lovers in Carroll County (FLICC) hosts the 15th Annual Foreign Film Festival at the Carroll Arts Center on Fridays in February. Tickets are $7 for adults; $6 for ages 25 & under and ages 60 & up. The subscription price is $22 and all tickets must be for either 1 p.m OR 7:30 p.m, no mix & match. Tickets are available on-line or at the box-office. Come out to Hashawha Environmental Center and enjoy pancakes with real maple syrup, learn how to tap a tree to make syrup, create a few crafts to take home, enjoy living history demonstrations and so much more. “We wanted a name that better reflected our effort for ‘inclusiveness’ of Main Street and its surroundings,” said Julie Della-Maria, executive director, Downtown Sykesville Connection. The Downtown Sykesville Connection will keep offering a range of events geared towards residents of all ages and to visitors seeking unique experiences and new trends, according to the release. The Downtown Sykesville Connection will remain focused on the beautification of the town and the preservation of its historical heritage. Della-Maria added that it was also important for the organization to be recognized for its accomplishments as opposed to their efforts being seen as town services. This will help the organization justify its engagement and mission in the community. Downtown Sykesville Connection will continue to work closely with the Town of Sykesville to best serve the community. 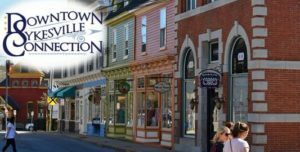 If you are interested in serving on a committee, email downtownsykesvilleconnection@gmail.com. The new offices are located at 7307 Spout Hill Road in Sykesville. Learn more about the organization at www.facebook.com/sykesville and www.sykesvillemainstreet.com. As we look towards warmer weather and blooming flowers, we start planning for the Easter Bunny to visit. Easter is on April 1 this year. Here are a few Easter Egg hunt activities taking place in the area. March 23 & 26: Easter Eggstravaganza, Eldersburg Branch Library Listen to Easter stories and songs, play a game, make a craft and participate in an Easter Egg hunt. All ages, refreshments will be served. 9:30 a.m. and 11 a.m. Friday, March 23 and 6:30 p.m. on Monday, March 26. Call 410-386-4488. March 24: Annual Easter Egg Hunt, Westminster City Park 10:30 a.m. for ages 1-4 and 11:30 a.m. for ages 5-8. Event is free, don’t forget to bring a basket to collect eggs. Each age group will have one golden ticket egg hidden among the eggs. 11 Longwell Ave., Westminster.www.westminstermd.gov. March 29: Twilight Egg Hunt, Westminster City Park 7:30 p.m. Ages 9-12. Music and prizes. Westminster City Park, 11 Longwell Ave., Westminster. www.westminstermd.gov. March 31: Special Needs Easter Egg Hunt, Church of the Ascension 2 p.m. Open to individuals with disabilities. Individuals must be accompanied by a caregiver. 23 North Court Street, Westminster. www.ascension-westminster.com. Check with your local library branch, local volunteer fire department and municipal government, this listing is what was available when the magazine went to print.